Welcome to day three of our Cotswold trip. 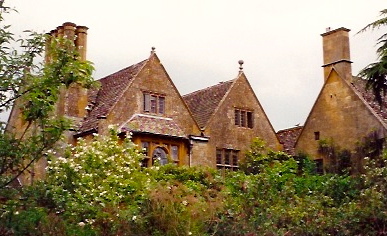 We’re headed to the village of Hidcote Bartrim near Chipping Campden, Gloucestershire. 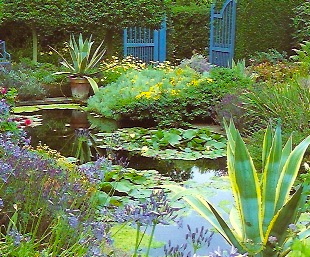 We must see Hidcote Manor Gardens, one of the best-known and most influential Arts and Crafts gardens in Britain. Created by Lawrence Johnston, his name is linked with other famous English gardeners I have previously written about on this blog. Johnston was given the property, almost bare farmland, in 1907 by his mother. 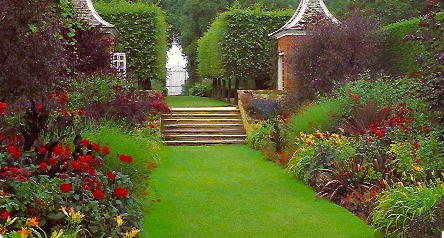 Over the next 40 years he created Hidcote Manor. The gardens surround the 17th century manor house pictured above. Gertrude Jekyll, Vita Sackville-West and Harold Nicholson at Sissinghurst Castle were designing gardens of hardy plants in a sequence of outdoor “rooms.” Johnston, dealing with a difficult site and open fields created a series of ‘rooms’ to protect the gardens. He planted box, hornbeam, and yew hedges and made use of stone walls to create his spaces. Please note that Johnston had no background as a gardener when he began Hidcote acquiring his skills along the way. He can inspire us to do the same. Within the main garden we will find a ‘White Garden’ and a ‘Fuchsia Garden,’ the Red Border and much more. Some rooms have ponds and fountains, and all are planted with flowers in bedding schemes. Johnston’s ideas have been repeated in gardens throughout the world. For further information on Hidcote Manor. 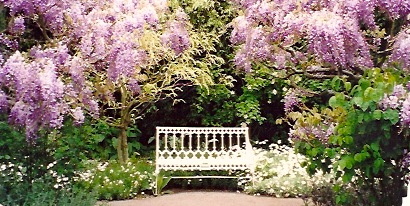 The photographs I have selected today are from my visit to Hidcote in 2000 on a garden tour. A tour that changed my life in many ways, and certainly influenced my writing life. I highly recommend Cotswold Gardens by David Hicks-Photography Andrew Lawson- Published by Phoenix Illustrated (if you can find it.) Hicks has other books on the subject. This entry was posted in A Trip To The Cotswolds With Stepheny and tagged Gertrude Jekyll, Hidcote Manor Gardens-Chipping Campden, Lawrence Johnston, Sissinghurst Castle. Bookmark the permalink. Leaving for Michigan in a.m. In touch from up there! That garden is sumptuous! Was that all wisteria in the last photo? Wisteria it is. We saw it everywhere in May. Beautiful, huh! If you have time look at the post on Sissinghurst because that garden is one of the most visited gardens in England and the design with room is wonderful. Glad you have been with me on this trip to the Cotswolds. Memories of these beautiful gardens have enriched our lives. Thankful to have had the experience. Looking forward to having tea with you and the others today as we continue our trip in the Cotswolds. Thank you for coming along! In my dreams my place looks like this, but then I wake up and realize I don’t have enough energy to even try. But I can dream, and your travels and photos give me lots of great ideas and are a great way to see the world. Thank you for taking the time to share all this beauty with us. Isn’t imagination wonderful.We can close our eyes and revisit the places where we have been happy. I am no longer able to garden as I once did, so on a smaller scale, I putter away. Very satisfying. This trip to the Cotswolds together through our imaginations works for me. See you at tea this afternoon.